The comforts and friendliness of the small Idaho town of Ashton are just one of the unique features that have earned this town’s annual Mesa Falls Marathon & Half Marathon raves as one of the nation’s 50 great marathons by the authors of the book From Fairbanks to Boston, 50 Great U.S. Marathons. Challenging and known for the natural beauty of the nearby forests, the peaks of the Grand Tetons off in the distance and wildlife native to this area just west of Yellowstone National Park, the race offers point-to-point courses for both its half and full marathons that start in the mountainous areas just north of Ashton and finish in the town center. The half marathon starts at the midway point of the full marathon, which begins in the Targhee National Forest north of town and makes its way southward toward what is perhaps the local area’s most well-known natural landmark, the 110-ft. and 85-ft.-high upper and lower Mesa Falls. Carved by volcanic eruptions and river currents hundreds of thousands of years ago, the falls offer a truly breathtaking view just as runners are reaching the 11-mile marker, before the half-marathon starting line. 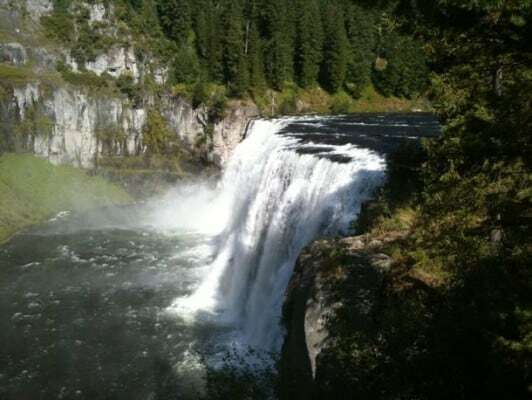 The event’s half marathon starts at Mesa Falls’ Bear Gulch, and for the first three miles takes runners across packed trails, old railroad beds and other natural surfaces alongside the scenic Warm River. For the rest of the race (the last 10 miles), the surface is paved, and offers views of the Teton Mountain Range and Idaho’s potato farming countryside. Though mostly a downhill course (with an overall elevation drop of nearly 500 feet), the race includes one uphill area between miles 4 and 6 (miles 17 and 19 in the full marathon). Those running the 13.1-mile race won’t miss out on the scenery, however, as the hills, trees and wildlife continue all the way down through the forest — and runners shouldn’t be surprised to see a host of wildlife including moose, elk, buffalo, wolves, cougars, bears and more. As the race route unfolds through the Targhee National Forest, runners will make their way along a long steady downhill stretch, starting at roughly 5,800 feet above sea level at the half starting line and finishing at about 5,200 feet above sea level at the finish. Located in eastern Idaho about 20 miles from the western edge of Yellowstone National Park, the Mesa Falls area is closest to the city of Ashton, Idaho, which tends to see mild to warm weather this time of year, while rainfall is typically scarce, averaging just over an inch for the month. See the Mesa Falls Half Marathon course map here. To reserve your spot in the 2019 running of Idaho’s Mesa Falls Marathon or Half Marathon, register online at ChronoTrack.com here. Ever run in the Mesa Falls Half Marathon? Share your impressions here, or post your review in the Comments box below.